Having exhausted most of the mild weather parts of the US over the last few years, we were forced to look beyond the borders for ideas to spend our 2005 Thanksgiving break. 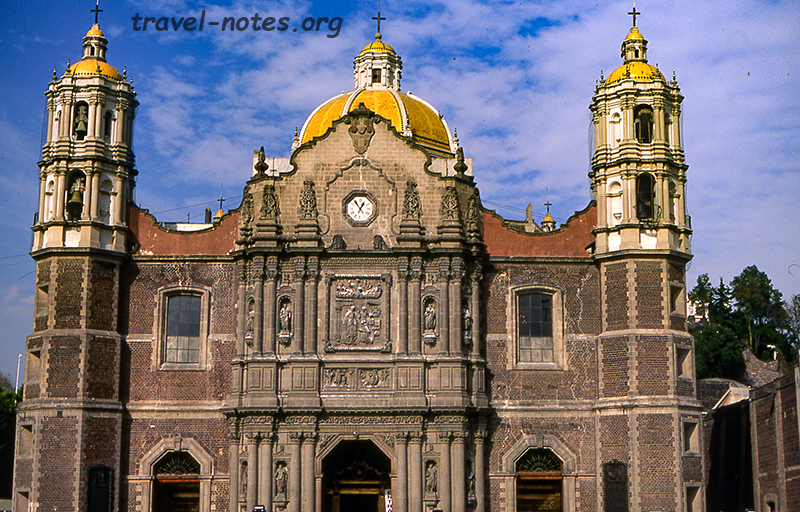 The result was our second trip to Mexico in the calendar year - this time to the capital Mexico City, DF - what many Mexicans consider to be the world's most populous city and the home to the world's largest public square. Well... they may not be quite right. Internet informs me that Tokyo, NY and Bombay are ahead in the former count and Moscow's Red and Beijing's Tiananmen are ahead in the latter. Coming back to our trip, it started off with a visit to the country's public education department. Tourists flock to the city's public buildings not to see the workings of a soporific government organisation but to gape at the monumental murals that adorn them. Most of these murals are pained by the big three - Diego Rivera, David Siqueiros and Jose Clemente Orozco - around the great depression of last century when the fascination with the left was at an all time high. Secrataria de educacion publica had its share of Rivera's gems. After spending about an hour in front of the murals we headed off to Chapultepec (Aztec for grasshopper) park, one of the largest urban green space in Latin America. Chapultepec park is home to some of Mexico's best museums and we went straight to its best - The Anthropology Museum, rated by some to be infact the best on the planet. The museum, an absolute must see even for someone who detests the subject, is a never ending array of who is who of the pre-Colombian civilisations to have occupied Mexico. 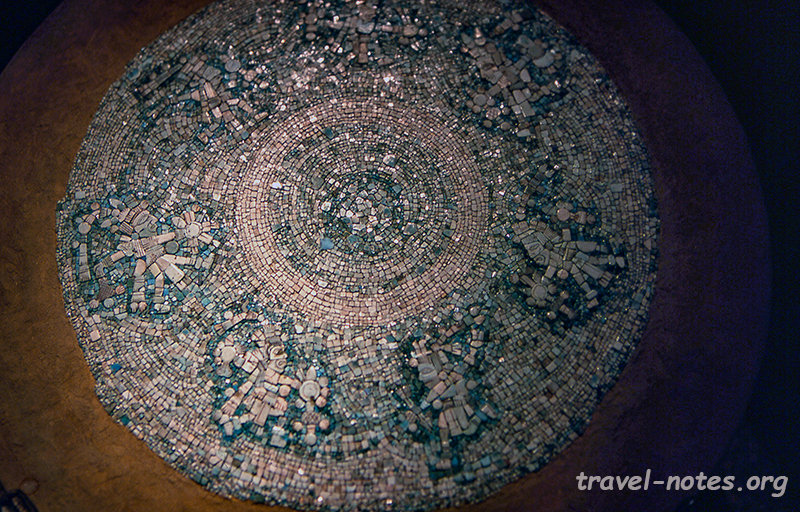 Not to be missed include King Pakal's recreated tomb and his stunning jade mask in the Mayan section, larger than life Olmec heads in the Gulf section, Tula's 4.5m tall statues in the Toltec section, recreated temples in the Teotihuacan section and of course the famous Sun Stone in the Aztec section. After standing on our feet for better part of the day, we somehow found enough energy to climb upto the highest point of the Chapultepec hill and visit the nation's only castle. 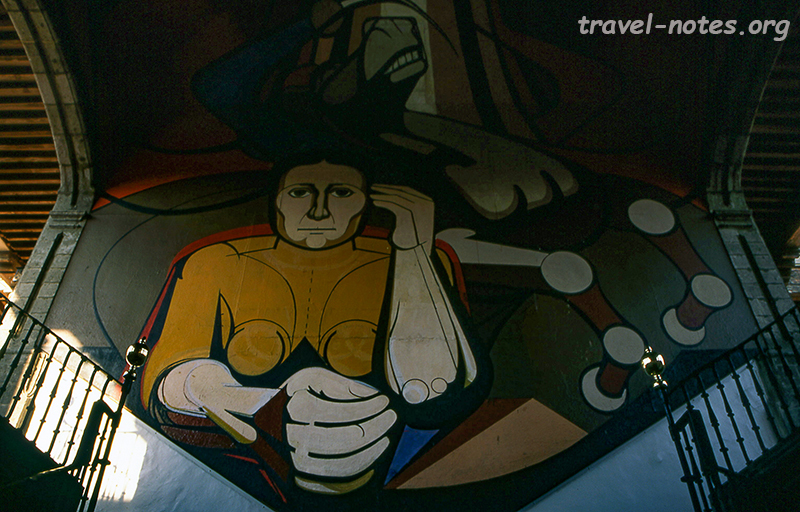 Siqueiros murals and the stained glass rooms of Maximilian's castle ensured that our effort did not go unrewarded. The following two days, we got away from the city despite the best resistance from its gridlock traffic to visit a couple of famous ruins - Teotihuacan (located about 50 kms from the city) and Tula (located at about 65). Teotihuacan, built during the initial centuries after Christ's birth, is so old that they were already in ruins when the Aztec stumbled upon them. The name means "the place where men became Gods", a clear indication that the ruins has been striking wonder in people's heart for nearly a millennium! 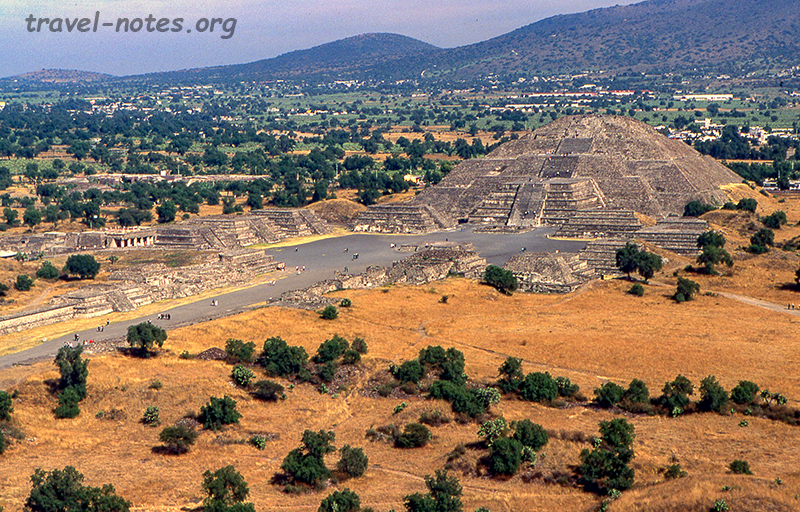 The site is home to world's third largest pyramid - the Pyramid of the Sun. The view from the top of the pyramid and the murals around the various plazas are absolutely priceless. 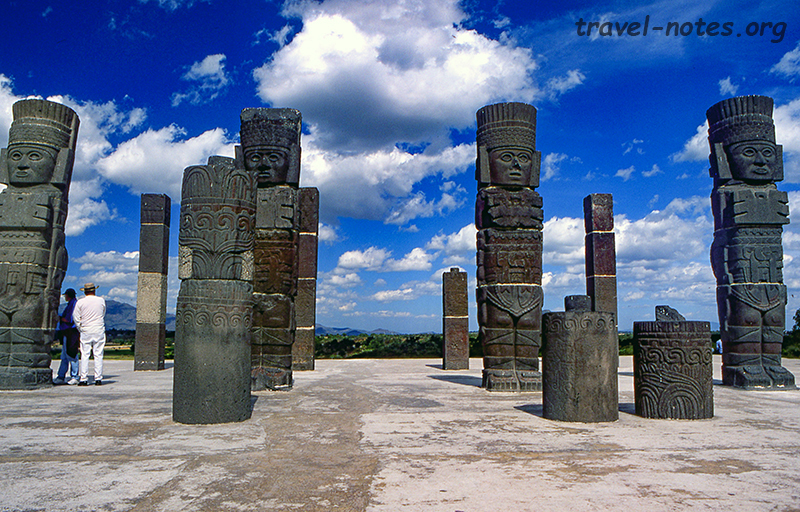 Tula was built much later by the Toltecs - ones that immediately preceded the Aztecs - ones that immediately preceded the Spanish rule. 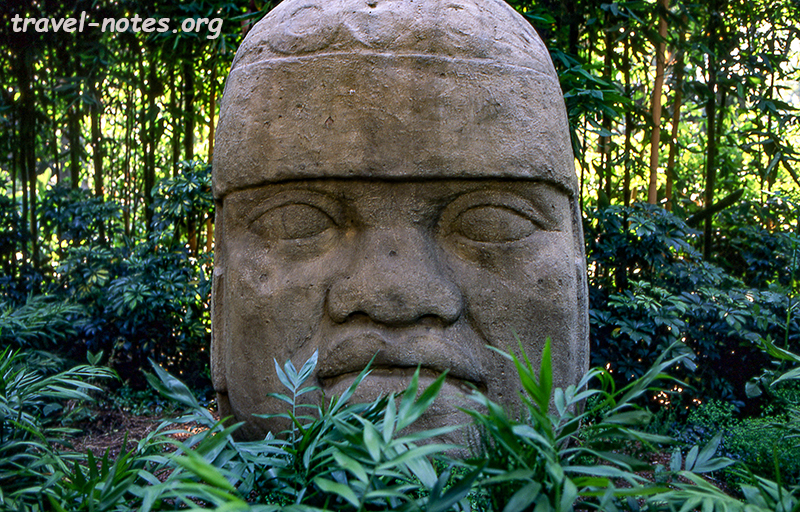 The ruins are famous for the 4 gigantic 4.5m tall statues standing in full attention on top of a pyramid. Between the ruins, we found enough time to squeeze in trips to the National Palace, home to the President and Diego's stunning representation of Mexican history in a series of eye-catching murals, Basilica de Guadelupe, home to Mexico's patron Goddess and Tepotzotlan's brilliantly ornate Iglesia de San Francisco Javier. The final day of our trip was reserved to check out the sights around the Zocalo - main plaza. We started off with the Templo Mayor - the jewel in the Aztec capital of Tenochtitlan before it was clinically dismembered by the Spaniards. Despite the destruction, the temple museum still holds on to a few gems including the 8 ton disc of Goddess Coyolxauhqui (discovery of which actually prompted the excavation) and the very well preserved terra-cotta Eagle Warrior statues. Next few stops were to see more murals that adorn the walls of Colegio de San Ildefonso, Mural museum and the Palacio de Bellas Artes (Fine Arts theatre). The pick of these are Siqueiros' New Democracy, Diego's controversial Man, the controller of the Universe and his mammoth Sueno de una Tarde Dominical en la Alameda. We finished the day off with a whirlwind trip through Baroque and Renaissance art by various local artists in the National Art Museum. Sometime during next few hours when we were resting our sore muscles waiting for our return flight, the reality finally sunk in - despite four days of extreme sight seeing, we had barely started scratching the surface of this magnificent city. Click here for more photos from Mexico City, DF. Click here for more photos from Teotihuacan and Tula sites.